is a member of the Worship and Life Committee. Barb does all of these things and more. And, she has come out of retirement twice to save our bacon. She originally retired in June of 2014 after thirteen years of dedicated service as our Music Director. She came out of retirement the first time in 2015 when we bid farewell to Ian Guenette as he headed to the prestigious McGill School of Music to further his studies and the second time last year when Tony was on leave. It should be noted that we didn’t have to ask her if she would consider filling in Barb simply and immediately volunteered. There are many things that have embodied Barb’s leadership in her role as Music Director but the three that are particularly notable are: Mentorship, Creativity and Faith. Barb as mentor encouraged budding and professional musicians alike to bring their particular gifts to St. Andrew’s. Over the years, under her leadership, she has showcased and nurtured the talented children of our church family. We have had the privilege of listening to: Hunter and Hanna Blair, the Gillan children: Taylor, Jaclyn, Lindsay, Nicole, and Blake, Dana Hudson, Danya Hakeem, Analiesa & Noah Reid, and many Sunday School choirs comprising the children of all of our church families. She encouraged members of the choir to tackle solos and add their instruments to our sound. We have thrilled to the haunting sounds of David Sales’ oboe and his new EWI, Hunter Blair’s fiddle, Laurie Boon and Emily Nanne’s guitars and of course Bob Armstrong on keyboard. She worked with each of us to make sure we were comfortable when a solo was on the schedule. Cheryl, Ken, Laurie, Shirleen and I all appreciated her confidence and support as we did our best to tackle new solo pieces. When I think about Barb’s creativity I think of all of the musicians she has invited, cajoled and enticed to come to St. Andrew’s. The list includes groups and ensembles such as The five, The Stairwell Carollers, The Valley Men, The Nepean Choir and Tutti. Added to that is a long list of solos performers including: Colleen Saddler, Doug Russell, Emily Armstrong, Jennifer Blair, Kyle Felaver, Mark Piper, Marty Russell, and Mike Ryan to name a just a few. Her creativity has also resulted in a great many highlights over the years. In 2007, she orchestrated a coup for our small congregation, with the Besig Price Music Workshop. This workshop, presented by well-known composers Don Besig and Nancy Price, was nothing short of a triumph. Choir members and directors from all over Ottawa and beyond attended. The sanctuary provided wonderful acoustics for almost 200 voices that day. It was a tremendous event and fund raiser. In 2010, we started the year by singing the National Anthem as the puck was dropped at a Frost Fest Junior A hockey game. In 2011, the highlight of our musical year was the preparation and presentation of "A Tapestry of Light", a Christmas Cantata by Joseph Martin. We were accompanied by The Celtic Winds Consort, organized by David Sale. A large audience donated generously to the Lanark County Food Bank. In 2015, Barb organized special music for Jeff’s covenanting service. David Sale on his oboe and me singing Leonard Cohen’s Hallelujah to lyrics written by Rev. Debbie Roi were her brainchild. That year Barb also helped the Sunday School children turn the Grinch from a foul one into a fine one at the White Gift service. Barb also started the tradition of an annual Carols for Christmas Concert, supported the annual World Days of Prayer, insisted that the choir be part of the music at the Cemetery Service in what we affectionately call the “Majestic Pines Cathedral”, helped get the children ready for White Gift services, organized a Homegrown Café, and supported all of the “Services in a Different Key” in the Dining Hall. When I mentioned faith as a cornerstone of Barb’s music leadership I didn’t mean faith in God - although she has that in spades. I meant rather her faith in the choir. Barb somehow thinks we are better than we are. Barb has complete, unwavering, unshakable faith in our abilities. Where this comes from is unclear. The choir is small, with two exceptions we’re all pretty old and most of us don’t read music or have any formal voice training. And yet, Barb thinks we can pull off an entire cantata with professional musicians – and we do. She believes we can do a complete medley of Oklahoma with four rehearsals – and we do. She assumes we can sing solos and duets without ever having done so before - and we do. I’ve come to believe that our success – as modest as it is - is all, and only, about her faith in our abilities. So, we thank Barb, not just for coming out of retirement to fill in for Tony but for all she has done for the music program since becoming its Director in 2001. We offer our heartfelt thanks for your mentorship, creativity and faith in each of us. For your tireless, enthusiastic, hard work, for countless hours spent selecting, rehearsing and presenting beautiful music and for coaching and teaching each of us – all done with a beaming smile. On Sunday, October 29, 2017 St. Andrew's Choir paid tribute to our longest serving member Marg Sauermann. Marg has been singing in St. Andrew’s choir for sixty years! Marg started singing in a choir when she was 7 years old. The church she attended at the time held auditions for the Sunday School children. Those with good voices went into the choir and those who did not have good voices were introduced to other activities in the church. Needless to say, Marg was asked to join the choir. When she first came to Canada she took a break from choir singing because she didn’t yet speak English and the family moved several times in the first 3 years they were here. Marg joined St. Andrew’s choir shortly after she and her family moved to Pakenham in the summer of 1957. So, in 2017, Marg will have sung in the St. Andrew's choir for sixty years. She has sung in many choirs over the years including The Centennial Choir and The Valley Festival Choir. At one point she sang in three choirs at the same time! We think it is safe to say that she has a deep, abiding love of music and singing. The objective of choral singing is to sound, even when singing harmony, like one voice. As a choir we work hard to achieve that objective and even sometimes hit the mark. This doesn’t mean however, that as a choir member you don’t get to hear and enjoy the voices of those beside you, behind you, in front of you and in the same row as you. We are intimately acquainted with each other’s voices and are all in awe of Marg’s still beautiful soprano. It is still, at 96, strong, bright, flexible and always, always exactly on pitch. Marg sings with elegance and joy and sustains her top notes with what seems like complete ease. Marg is an important member of our choir and an inspiration to us all. She lets us hope that we can keep singing forever. 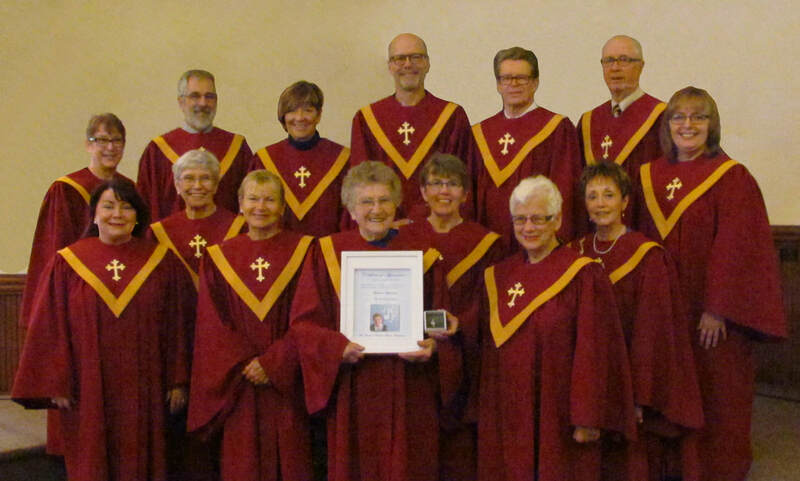 So on Sunday, October 29, 2017, we recognized Marg for her commitment to St. Andrew’s and its choir, for her always sunny disposition, for her great sense of humour and for her beautiful soprano voice that adds so much to our choir and the music we make together here in our beautiful church.